LongTailPro is a desktop keyword research tool which runs on Adobe Air (works on Windows & Mac). It’s a premium tool which costs $47/month ($30 discount with special link at the bottom). But you can also test-drive it for $1 using this link for the next 10 days. I suggest that you signup for their trial, so that you can try it yourself while reading this review and tutorial. One great thing about LongTailPro is that you don’t have to be an SEO master to use this tool. The user interface is simple and straightforward. You will get used to it very quickly. Head over to LongTailPro.com and take $1 trial for 10 days which has all the features you need to get started. The very first thing which you need to do here is to create a campaign. Do remember, the country which you choose is the search country for your keyword research. After creating the campaign, it’s a piece of cake, as the rest of the LTP (LongTailPro) interface is easy to use and is self-explanatory. This is where you will start your keyword research. You can use it for your existing site or you can use it for finding a new micro-niche website. I want you to pay special attention to the filter section, as it’s here that you will find keywords based on CPC. You can define a minimum CPC for keywords. If you want to find long-tail keywords, you should select the “Words” section and enter the minimum number of words to search for. For example, I’m using the seed keywords “Affiliate marketing”. Click on “Generate Keywords”, and LongTailPro will start doing all the hard work for you. It will take a few minutes to give you the results, so in the meantime, go grab a coffee. Here you can sort the list based on CPC, local & global searches. Before you move ahead, filter out the irrelevant keywords by clicking on the “X” mark. This will help you stay organized and keep your list clean. 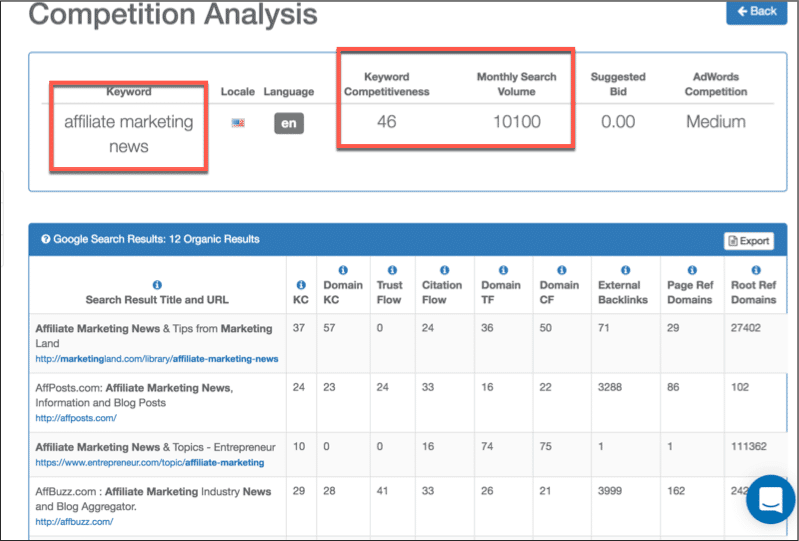 Now click on any of the keywords you find useful for your micro-niche site and it will take you to the Competitor Analysis page. When you are in a competitive niche, you need to pay attention to specific factors. For example, it would be easier to outrank any competition with less backlinks and less domain authority. The LongTailPro Competitor Analysis tool lets you check all of these important details. Notice the below screenshot and try to see how easy it is to find a “low-hanging”, profitable keyword. This is how you can find a list of highly profitable keywords for your niche site. Remember to make the most out of “Filter” in “Campaign Settings” and use the “X” every time to create a clean keyword list. Once you are done repeating the process a few times, go back to “Keyword Research” and click on “Export” to export your final keywords into an Excel file. So far you have learned how to use some of the LongTailPro features. Now let me show you what their platinum features can do for you. While looking into buying LongTailPro, you should get the monthly pro plan that allows 12,500 keyword searches/month. You will see a column for favorite keywords (“Favorites”) and in the keywords results page, you can favorite any keyword of your choice (see above screenshot). This is one feature which you are going to find very useful as this will let you pick the best keyword for your site without wasting a lot of time. In LongTailPlatinum, you will find the “Avg. KC” column on the “Keyword Research” and “Competitor Analysis” pages. 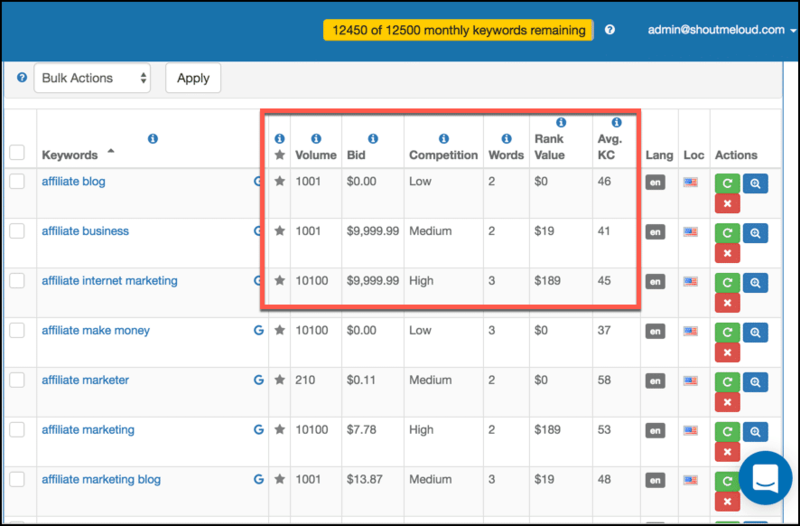 This will make it much easier for you to pick the easy to rank keywords based on keyword competitiveness. Note: This feature is no more available in their cloud version. I have reached out to their team to find out if they are adding this feature anytime soon. This is one of the least talked about features of LTP as most bloggers are using LongTailPro for only keyword research and checking keyword competitiveness. But this feature is really cool. You can check keyword ranking in major search engines (Google, Bing, Yahoo) directly from the comfort of your desktop. There are no limitations here and you can add as many domains or as many keywords you want. LongTailPlatinum is a keyword research tool for smart and modern bloggers. It doesn’t matter what kind of website you have, LTP will help you to find the best keywords that you can use for your blog to drive more traffic and generate more revenue in whatever methods you choose.